A well landscaped property that is properly maintained is an investment that yields a great return both, financially and aesthetically, often increasing property values by 5% – 20%. 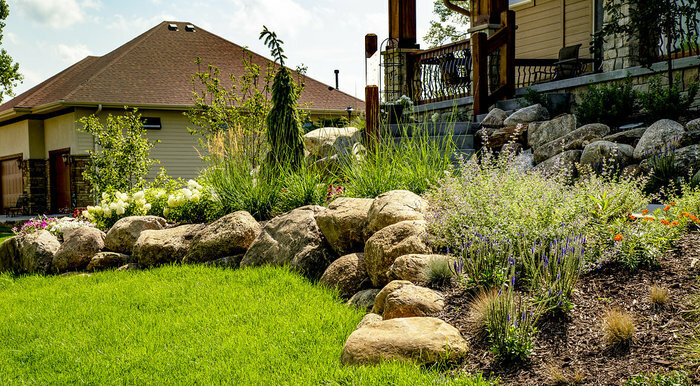 Jensen Gardens can create a customized program that will increase your pride of ownership as well as improve the health and aesthetic beauty of your landscape. We can integrate the lawn care with ornamental bed care and tree care to maximize the benefit to the entire landscape. The human response to a good landscape that is properly maintained goes beyond simply observing its’ beauty. We are “at home” there. Remember, even if we didn’t build your landscape, we can still maintain it for you. The key to nurturing your landscape includes insect control, disease control, weed control, and fertilizing. All of these moving parts working together enhance curb appeal and create a truly beautiful landscape. Jensen Gardens only uses pesticide products that are EPA registered. All pesticides are applied by state licensed applicators. We will make zone applications of herbicides for maximum effectiveness and minimal environmental impact. We offer full season customized fertilization programs and use only the highest quality products which contain the proper balance of nutrients that your lawn requires.